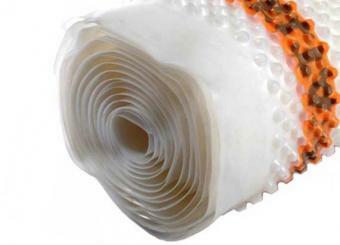 Seal the overlap joint between sections of cavity drainage membrane with this butyl tape. Delta Tape is used to seal the overlap joint between sections of membrane, using the flange. This professional waterproof tape is made from butyl and is highly flexible. It provides a watertight seal when cavity drainage membranes overlap, both on walls and floors. It is 28mm wide and double-sided. All of our staff provide free expert advice. Trusted Independent Supplier of Delta Products. Order before midday for next day delivery across UK Mainland. All Delta products are made to the highest standards.